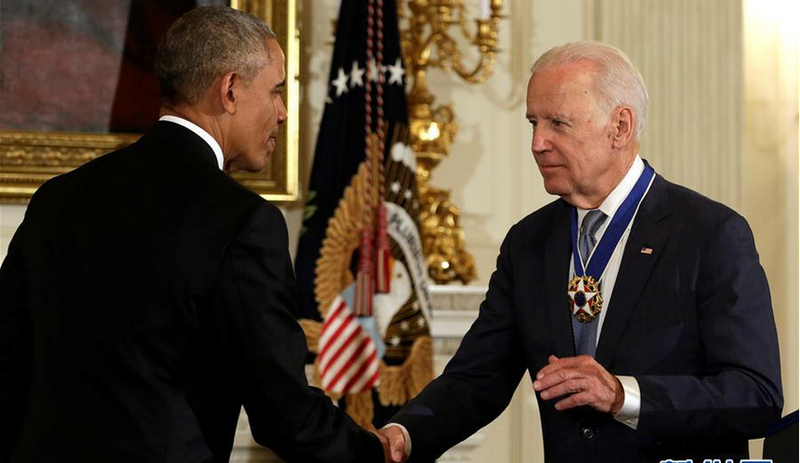 U.S. Vice President Joe Biden has been awarded the Presidential Medal of Freedom – America's highest civilian honor. Obama announced the award after praising Biden for his years of service, calling him "the finest vice president we have ever seen." The Presidential Medal of Freedom is America's highest award for civilians. Obama has awarded the medal to others during his presidency. But he explained that Biden's award carried an additional level of distinction that he has never given out before. "He was the best possible choice, not just for me, but for the American people." Obama said Biden's advice on many issues had made him a better president. He called the vice president "a lion of American history." "To know Joe Biden is to know love without pretense, service without self-regard and to live life fully." Both men said that during Obama's eight-year term, the two had developed a relationship that went far beyond their work. Many extended members of the Obama and Biden families also became close personal friends. He said he greatly valued being trusted by Obama in "every single thing you've asked me to do." He said he always found it easy working for and with Obama, for whom he said he had the highest level of respect. "I've never known a president - and few people I've ever met - who have had the integrity and the decency and the sense of other people's needs like you do." Biden said he hopes to always be able to look back and say, "I was part of the journey of a remarkable man who did remarkable things for this country." He noted that even though he felt he may not deserve the medal, he knew "it came from the President's heart." "Mr. President, you know as long as there's a breath in me, I'll be there for you, my whole family will be. And I know, I know it is reciprocal." His farewell speech marked his exit from politics. Looking back, I am staggered how easily it was all arranged. 1.Biden appeared shocked at the announcement, which he said Obama and others inside the White House had kept secret. They had given an absolute assurance that it would be kept secret. The exact locations are being kept secret for reasons of security. 2.In his tribute to Biden, Obama said that from the very start, he never regretted choosing him as his right-hand man. I would like to have a right-hand man on my work and my life. If you have a right-hand man on work, you will be light.